People love award ceremonies. There is something fun about seeing people all decked out in finery and regalia to receive awards of merit. There are a few which are near and dear to my heart. At my high school graduation, we walked proudly across the stage, accepted our diplomas, and secretly palmed off our marbles to our principal. I haven’t lost my marbles; I know right where I left them. My Eagle Scout ceremony was very nice with the bagpipes playing, a review of my scouting accomplishments, and a little roasting by the officials in my troop. I skipped out on my college graduation, but I have happily attended those of my family and friends (you should know which ones you are). We are quickly approaching the Academy Awards, and I’m looking forward to the lesser-known Raspberries. We all like to see people of merit receive the appropriate honors for their accomplishments, whether in movies, scouts or education. Well we have our own category to add. Congratulations! The numbers are in for electrical generation in Texas for 2010. Everyone who was holding their breath may now let it out. So who are the winners this year? Total power generation went up by 3.5% last year. In 2009, we produced 308,278 gigawatt hours and in 2010 it went up to 319,097 gigawatt hours. 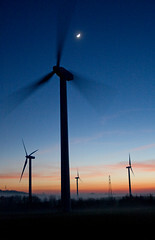 Wind energy went up 1.6% from last year to account for nearly 8% of total power generation. Never let it be said that we are running out of hot air in Texas! Coal went up by 8% in 2010. Hydro generated power also went up in 2010. All the other forms of power generation went done. Nuclear dropped by 3.6%. Natural gas was down by about 9 %. And all the others (PV solar, Solar thermal, bio, etc) were down by 0.1%. August 23, 2010 was the day Texans produced the most electricity (and used it as well). January 8 was the winter high for electrical production. January 8 was also a very, very cold day. But how will things look in 2011? I’ll make a few predictions. First the amount of electricity that Texas uses will go up. In a state with an upward population curve the amount of electricity usually goes up unless something unusual happens (like an economic downturn). Over the next few years we should see an increase in the amount of electricity generated by the new solar plants. Wind energy will also go up, again because of all the hot air in Texas. Even with this increase in solar, coal will remain the dominate electrical source in Texas. I hope that natural gas use would go up and cause coal use to go down, but it would take a large change in the price of coal and coal plants vs. natural gas and natural gas plants. It will be fun to look back in 2012 and see if my energy predictions came true. So you’ve got wind in your sails and have expectations of spinning up a bunch of gigawatts for next year?